Hellenic Air Force Daedalus Demo Team. Despite the glorious history of the HAF’s acrobatic teams which were first established in the 50s, like the "Four Aces", "Acro Team", "Greek Flame" and the "New Greek Flame", the HAF didn’t have any demo team for approximately four decades. But in the mid 2000s, it was decided to proceed with the establishment of not only one but two solo demo teams. Apart from the famous “Zeus” that a lot of people have the opportunity to see and admire in many airshows across Europe, there is another smaller team which is not so well known to the European theatre and is called “Daedalus” team. Inspired by Greek mythology, the team was named after “Daedalus”, who was the father of Icarus. The word originated from the word “δαιδάλλω”, meaning "to work artfully". So, performing a display is, nonetheless, a work of aerial art. Additionally, the team consists of instructor pilots who, like modern “Daedalus”, pass on their experience, and "give wings" to their student pilots. 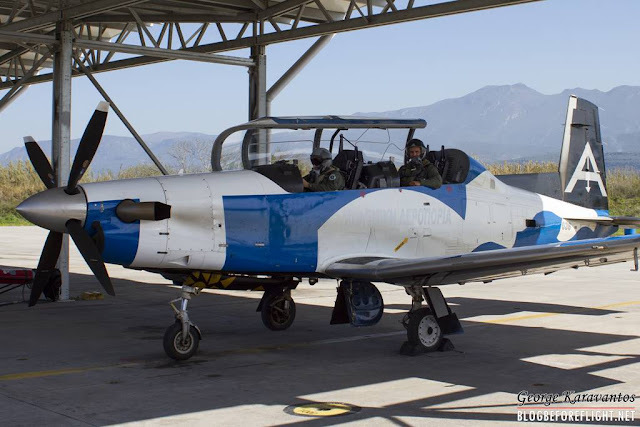 The T-6A Aircraft Demonstration Team was established in 2005 in the context of the 1st International Air Show "Archangel”. Following communication with United States Air Force, two USAF instructors, namely Captain Jeff Stift, instructor of the West Coast Demo Team and Captain Eric Mc Umper, Ground-Flight Safety Observing Officer of the East Coast Demo Team of USAF, arrived at 120 Air Training Wing, in Kalamata to train the Greek future demo pilots. In total, five pilots from 361 Air Training Sqn were trained. 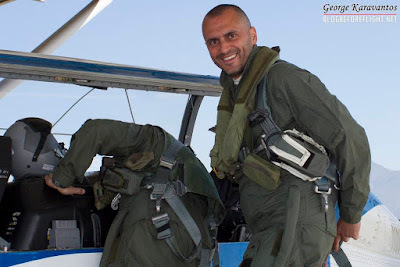 The two pilots who were chosen to carry out the Air Show's flight project was Major (I) Nikolaos Chriistopoulos and Major (P) Nikolaos Malapanis. The training course began on 26 July 2005, was concluded on 16 August 2005 and included 18 co-pilot flights and 12 solo flights. 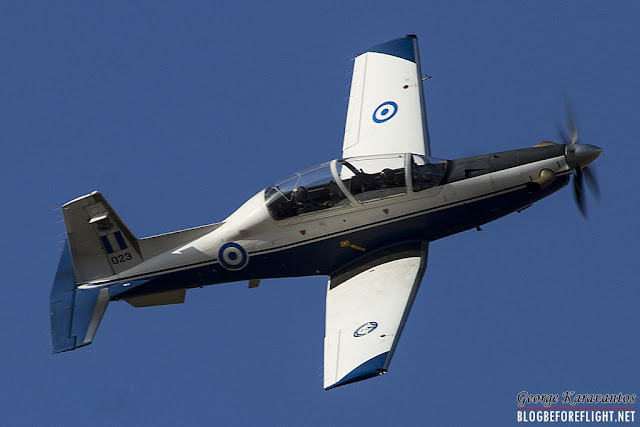 On the 18th of September 2005, the T-6A Aircraft Demonstration Team performed its first public air show at 114 Combat Wing at the airfield of Tanagra, during the International Air Show "Archangel" in the context of the festivities held to honour the Hellenic Air Force's Patrons, Archangels Michael and Gabriel. 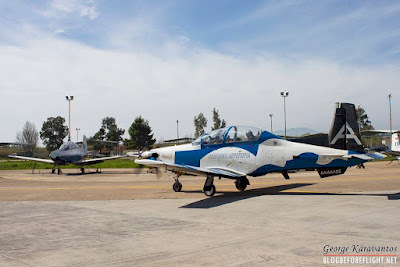 In order for each air show of the T-6A Aircraft Demonstration Team to be successful and safe, the harmonic cooperation of a number of people is required. - The main Demonstration Pilot. - The Flight & Ground Safety Observing Officer, who is responsible for the continuous control of the flight project's safe conduct, observing the limitations regarding the flight height and has the jurisdiction to intervene and order the interruption of the maneuver if he decides that it is not performed correctly. - The narrator officer, who is responsible for narrating, explaining and commenting on the maneuvers performed to the public. 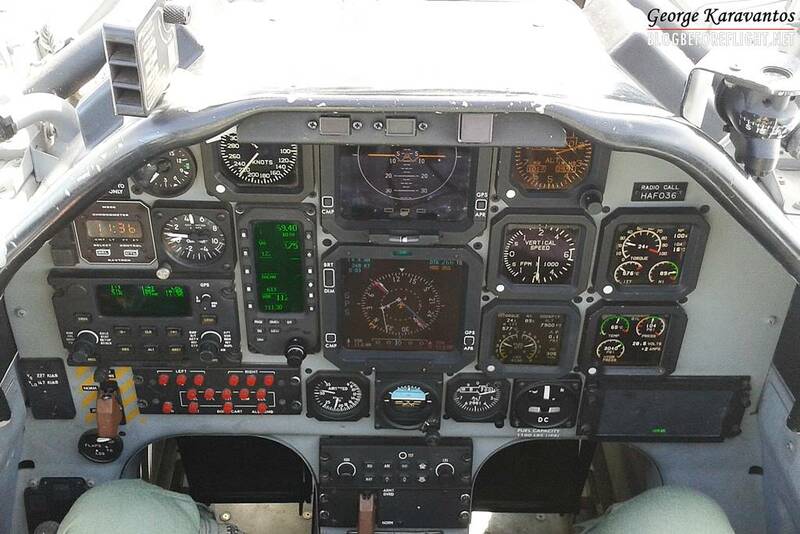 - The aircraft's preparation and support technical personnel. 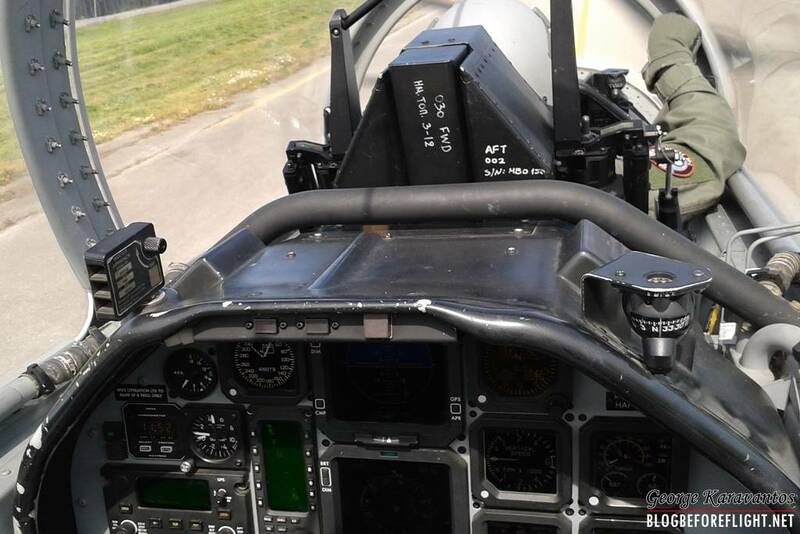 Apart from demo pilots, all the other members have an assigned main role but are, also, always ready to perform secondary duties in case needed. Team has, at the moment being, 6 pilots and 9 aircraft engineers. Minimum clouds base altitude of 4,500 feet above ground level (AGL) and horizontal visibility of 5 km. 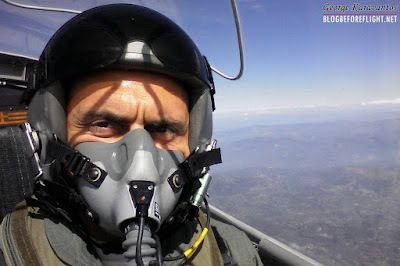 Minimum cloud base altitude of 2,500 feet above ground level (AGL) and horizontal visibility of 5 km. Both programs include high performance manoeuvres with accelerations ranging from -1 to +7g. During the conduct of the show manoeuvres, the aircraft's speed ranges from 80 to 260 Knots and reaches down to 20ft from the ground. The High Show lasts 10 minutes and 30 seconds and the Low Show's duration is 8 minutes and 30 seconds. The team performs its routine display mainly inside Greece. 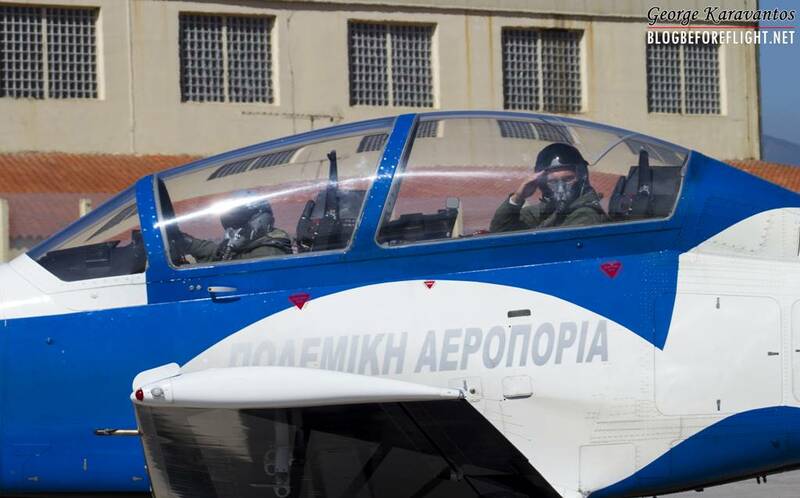 Annually, during HAF Open Days every November and, so far, it has attended to all the domestic airshows (Archangel, Athens Flying Week, Kavala Air & Sea Show). 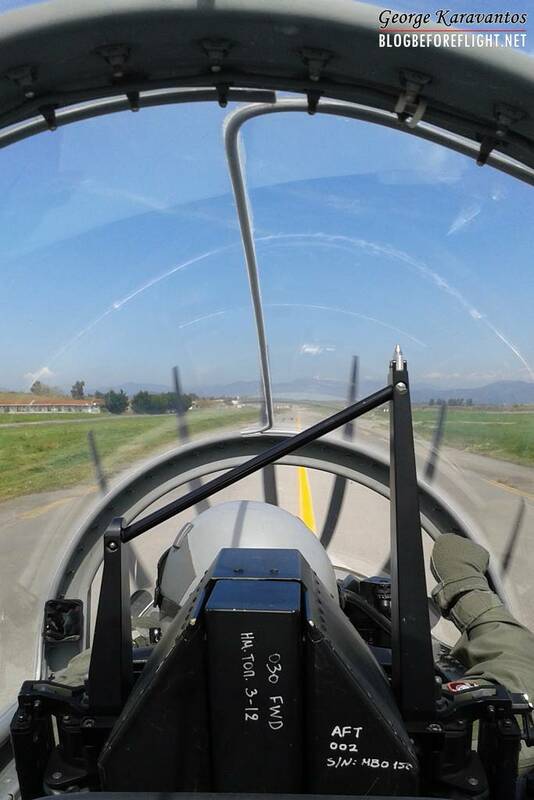 Only in 2015, the team flew outside Greece and visited Malta to attend to its annual airshow there. Running the 13th consecutive display season in 2018 makes us the longest ever lived display team through HAF history! 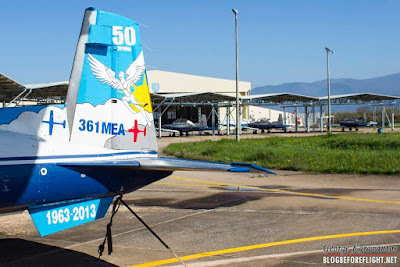 In 2015, the demo aircraft received a special painting to commemorate the teams 10th anniversary. The upper part of the aircraft depicts a huge waiving Greek flag. The design under the fuselage is based on the Icarus flight close to the sun, according to Greek mythology. Moreover, two of his inventions are displayed on the tail section, the caliper and the maze. The T-6A Aircraft Demonstration Team constitutes an ambitious venture which aims at spreading and cultivating the air concept in the Greek community and at enhancing the morale of the Hellenic Armed Forces, while, at the same time, it is projecting the work of the Hellenic Air Force to the wide public. The T-6 is a development of the Pilatus PC-9, modified significantly by Beechcraft, which was part of Raytheon at the time. Designed for the US Joint Primary Aircraft Training System (JPATS) it was named after the legendary T-6 Texan pilot trainer of decades ago and also replaced the T-37 in US service. 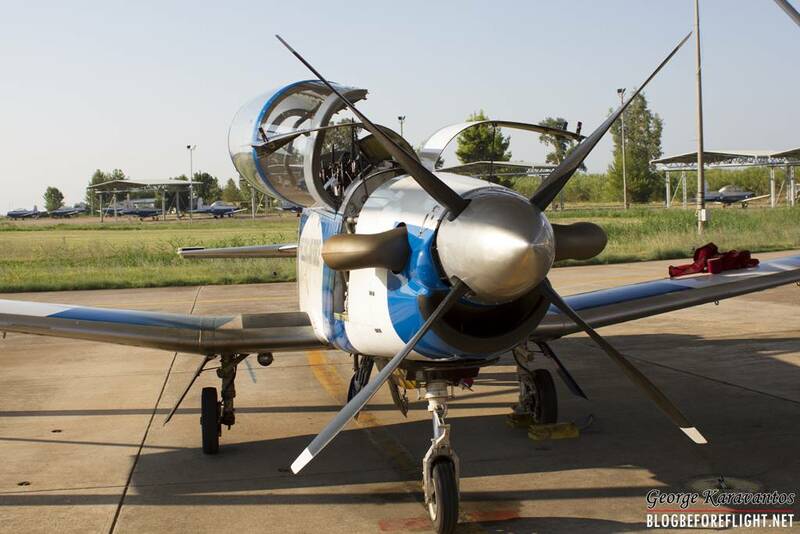 The T-6A Texan II is powered by a Pratt & Whitney PT-6A-68 turbo-prop engine providing 1100shp and has a climb rate in excess of 3,300ft/min (1,000m/min). The maximum cruise speed of the aircraft is 310mph (500km/h) and it has an altitude ceiling of 31,000 feet (9,500m). The cockpit was designed for similarity with modern fighter aircraft with Smiths Aerospace multi-function active matrix LCDs. In addition to the ‘digital’ cockpit, the T-6 also has a pressurized cockpit and Martin-Baker Mk.16 zero-zero ejection seats. 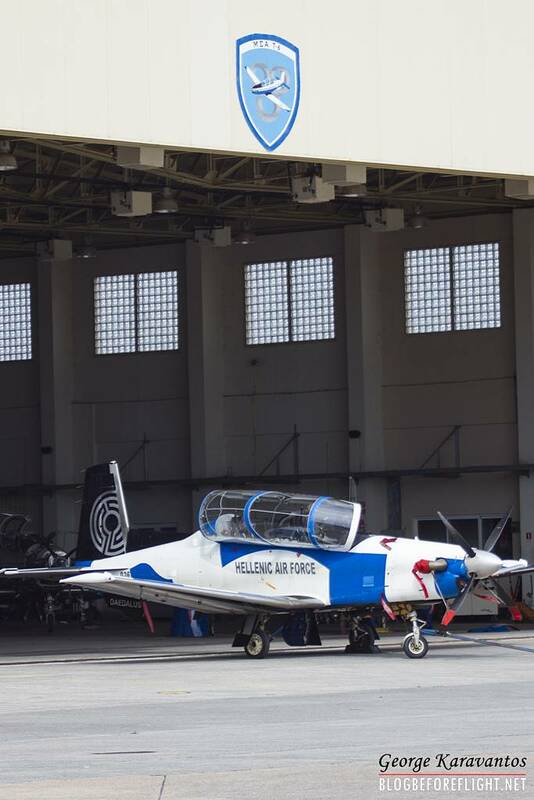 The Texan II fleet operated by the Hellenic Air Force consists of 25 standard T-6A and 20 T-6A-NTA models, the latter having six under-wing hard-points which are capable of carrying a variety of air to ground weapons for a limited ground-attack capability. The serial numbers of the T-6A version are 001 to 025 and for the NTA version 026 to 045.